West Virginia University is doing a study, using Fry Poultry Farm's Poultry litter Biochar, to improve nutrient and sediment retention as a part of their Chesapeake Bay (Cacopon River) watershed improvement project. The West Virginia University Environmental Research Center is evaluating the use of biochar to boost reforestation efforts on reclaimed mined lands; to increase pasture and crop productivity; and as a soil amendment for golf courses and other intensive turf management applications. 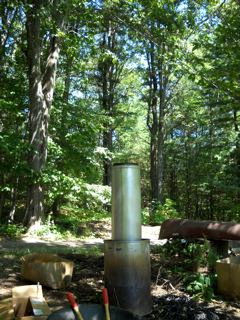 Australia’s first Adam retort Biochar Kiln. Biochar Industries in Kunghur NSW Australia was the setting for this momentous occasion. Monday 16th of May 2011. With an even bigger surprise to come this statement by an Australian Biochar Expert. Read the whole story on www.biocharproject.org. Cost :	$15.00 per person. Hugh McLaughlin, PhD, PE, Alterna Biocarbon Inc.
As the world of biochar expands, the need for definitive research to answer core questions grows. One such question is “What is the role of adsorption and when does it make a pivotal difference in growing situations?” Answering those questions has been hampered by the historical absence of adsorption as a monitored property in soils and soil components (as compared to CEC) and the lack of a reliable method to create low and high adsorption biochars. While there is little that can be done about the former situation, the later may have a fairly facile solution, which will be presented here. A study recently completed in New Zealand found that adding biochar to the soils of pastures where Cows (ruminants) were grazing sharply decreased the excess nitrous oxide from the cows urine. It appears that the biochar helps the soil absorb the extra gasses although long term testing of the effect of cow urine and pasture with biochar still needs to be done. A summary is here: Can Biochar Help Suppress Greenhouse Gases? Hugh and Jerry did a super job of introducing biochar at Heating the NE but obviously next year this session needs to be expanded to a more complete exploration of the potentials. I'm lucky to have Hugh so nearby to assist me and now that I've found an avenue of biochar use (inoculation). I am in need of some techniques that create as much as possible as easily as possible. 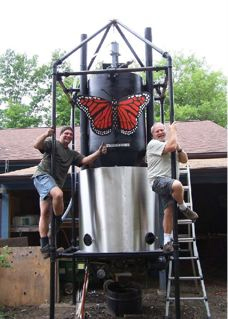 Probably the next thing Hugh and I'll be trying is a variation on John Roger's 55 gal. TLUD. 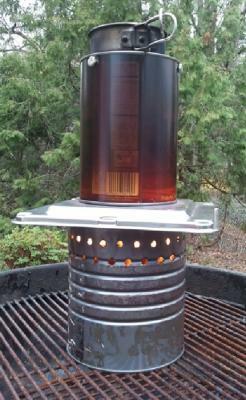 My "3 barrel top lit up draft rocket retort" is dead at the moment as I've burned up all my little retort barrels and I want something that makes more than 5 gallons of char/hr. 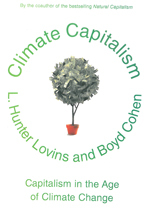 Hunter Lovins and Boyd Cohen's book includes a short section on Biochar. Their book makes their case through including short profiles on people working in the areas they are highlighting. 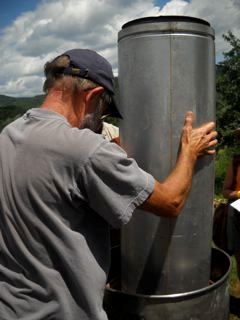 Both the International Biochar Initiative, and Nat Mulcahy's World Stoves project in Haiti are mentioned. 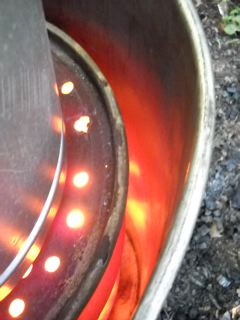 Method: Top lit updraft (TLUD) pyrolysis in a small and simple selfmade stove. 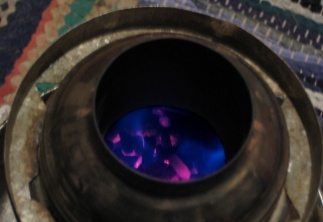 When the pyrolysis zone hits bottom and the big bright flame reduces to a small blue flame, then the stove is closed airtight with a lid and covered with a can and let cool down. Burn time ca. 35min. Batch size: 325g. Total pellet input: 2264g. Volume reduction is roughly in accordance with estimates in en.wikipedia Charcoal and de.wikipedia Holzkohle. * from the characteristics of TLUD pyrolysis: "more of the bio-oil condensates are driven off" (loc. cit.). 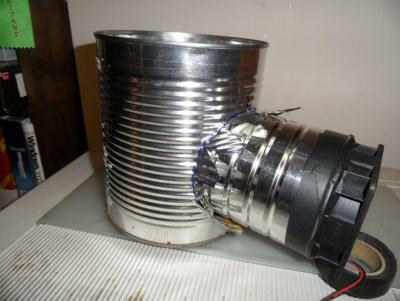 * as wood pellets are made from saw dust, the wood pores are more accesible and volatile components easier driven off. 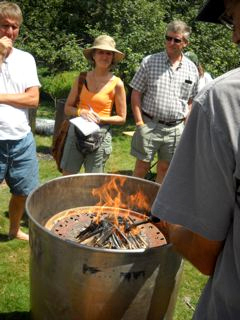 The biochar is produced from urban lop, grape pomace, wood, miscanthus and other suitable biomasse. The biochar production is guaranteed climate-positive and free from eco-toxicological substances. 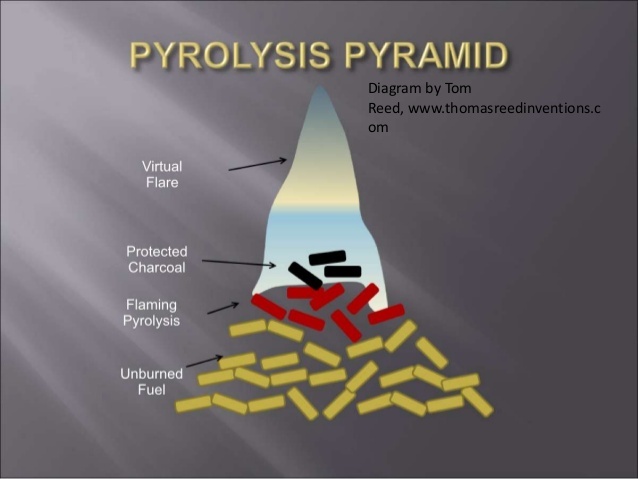 The high quality biomasses are pyrolysed at 400 to 450°C to come up with particularly effective microporosity of the biochar. 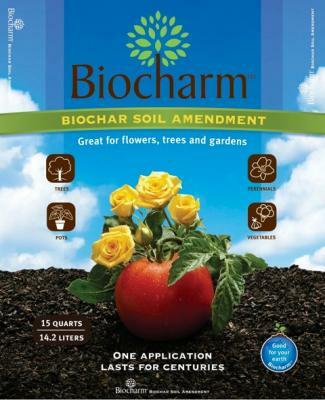 It is recommended to activate the biochar with ripe compost at a volume ratio of 1:1 until 1:2. We recommend the application of 10 tonnes of biochar per hectare or 1 kilogram per square meter.